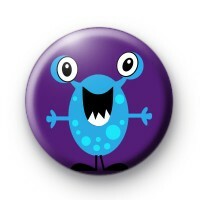 Cute Monster Hug Badge in purple with a really cute bug-eyed monster in blue with blue spots and big googly eyes at the top. These badges are always popular with schools & school teachers & are perfect for younger children and primary school kids. Our monster badges are also fun for younger kids at Halloween & can be combined with some of our Halloween button badges to add a little extra fun to school uniforms. We have a great range of cute badges & monster badges available & the illustrations are so cute. Standard 25mm badge made by hand in our family run workshop. We deliver to anywhere in the world & delivery is free on larger orders. We also have a next day delivery option for those of you who need badges at the last minute. PErfect for rush orders.